Color balance describes the intensity of the source colors in relation to each other. Typically the laser sources are red, green and blue. With matching these colors and adjusting the intensity per color source it is possible to create millions of color shades (if the laser is capable to do analog modulation). The goal of color balancing a laser system is to achieve an optimal white output with the use of all sources and to also set the same shade of white to all laser systems used at the same show. The color balancing is done by selectively reducing the intensity of the source colors to match the desired shade of white. This can be done directly at the laser system, if it is equipped with hardware side adjustment features, or through the control software. How can I improve the color balance of my show laser light system? If you can control your laser system with a professional show laser software, you can adjust and tweak the intensity of each color with the software. It is possible to adjust the color shade by reducing the intensity of certain source colors. 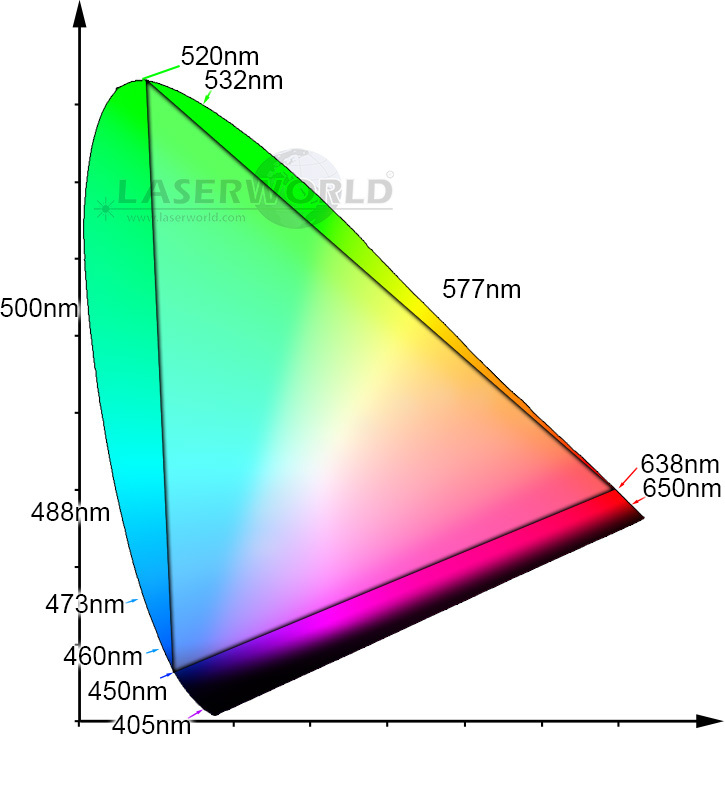 Color Triangle - which colors can be displayed with laser? Standard show laser light systems usually have RGB color mixture nowaday, which means that they have a red, a green and a blue laser source that match up to white (depending on the intensity per source). With such an RGB system it is possible to create a large rage of color shades. Depending on the wavelength (color) of the sources the colors that can be displayed can vary. Below graphics shows the RGB color mixture triangle of a common pure diode system. With such a system most color shades can be displayed, but UV shades, certain pure yellow color tones and some cyan color shades, however, cannot be created with such a setup.You can also see that it is possible to create plain, beautiful white with the use of just two sources as well - yellow and cyan.